Blending her poetry and lyrics with the deep, highly textured musical stylings of some extraordinary players (including: Alex Acuna, Vinnie Colaiuta, Larry Klein, Strunz & Farah, Robert “Baabe” Irving III, David Ricketts, Sophie Barker, Iki Levy, Mike Rowe, Richard Fammerée, Keithen Carter, Jon Smith, Eric Yoder, Cheryl Wilson and David Tickle,). Risa's albums are the first of their kind: truly heart-felt music and poetry from the soul, both inspiring and captivating. Her award-winning poetry has been described as “a poetry of soul-making.” Dr. Kaparo’s deep commitment to the art of awakening is also reflected in her creation of Somatic Learning®, a self-healing methodology of psychological, somatic, and meditative disciplines. "Embrace is a spiritual autobiography; rich, engrossing, it climbs the levels from language to psychology to archetype. Risa Kaparo writes a poetry of soul-making." "When Risa Kaparo writes about fire, you feel it. Her gaze is like life. You’ve got no place to hide. Kaparo holds you in her poetic grip, a poet who makes beauty out of your suffering." 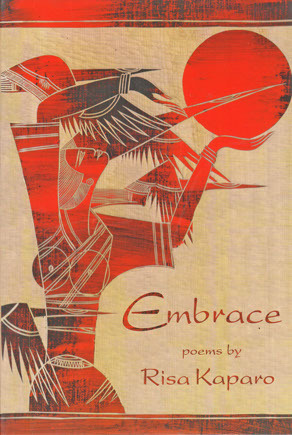 "Embrace is poetry fired in a crucible of compassion, lyrical narrative that moves from abuse to love and redemption. These poems are autobiographical and mythical at the same moment, visceral and spiritual. They sing." “a poetry of soul-making.” Dr. Kaparo’s deep commitment to the art of awakening is also reflected in her creation of Somatic Learning®, a self-healing methodology of psychological, somatic, and meditative disciplines.